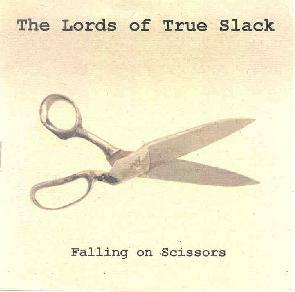 The Lords Of True Slack - "Falling On Scissors"
The Lords Of True Slack was the duo of Eric Wallack on guitar, digital guitar synth and upright bass, and William (BJ) Price on guitar, analog guitar synth, moog synth, effects and loops, and sometimes included Nick Conrad on drums. The group was all improvisational, never rehearsed, and only existed for four performances during 2000, all taking place at the now defunct anarchist bookstore, Pauper's Books, in Bowling Green, Ohio. The music on Falling On Scissors is from the three of these four performances that Wallack recorded. The first four tracks feature duo performances by Wallack and Price using their stringed instruments and effects. The music falls somewhat in the same realms as Wallack's Galaxies mini-disc, though there's lots more happening here with the two musicians putting their collective arsenals and creative energies together. "The Sadistic Music Corp" opens the set with winding, haunting soundscape guitar notes and ambient guitar produced backdrops that create a meditative but thoroughly spaced out journey. The duo trip along and inject melody into the proceedings, though it's the drifting over a rolling aural landscape elements that stand out. "BJ And The Drum Groove" is a standout track, containing elements of early 70's kosmiche like Tangerine Dream or Klaus Schulze, though perhaps even more like Ash Ra Tempel. The trippy guitar and percussion infuse the music with a freaky otherworldly Middle Eastern/Indian vibe that I enjoyed. The Eastern influences are even more overt on the aptly titled "Wrong Turn At Bombay", though it a occurs within a freeform, jazz-kosmiche stew that gets pretty damn fiery. "Triangles" is a bit different, being something of an avant-garde chamber orchestra-in-space tune with very cool horn sounds. The liner notes point out that Wallack triggers drums, sitars, organs, flutes and clarinets from his digital guitar synth, which explains much of the varied sounds and instrumentation we hear on the album. But there's a kind of Peter and the Wolf styled story-telling feel to the music, and throughout it's nearly 10 minute length the track evolves through multiple themes and scene changes. It really amazes me to think that this was completely improvised by musicians who only ever played together on four occasions. Some transitions are less smooth than others but for the most part it sounds like it could have been composed. The first of the tracks with Conrad on drums is "Ululating", which has some great guitar produced keyboard sounds and Wallack's upright bass is a welcome addition. The trio seem to flail about for the first few minutes trying to find common ground, at first sounding like they're going to be doing an older school free-jazz jam, but around the 4 minute mark everything seems to gel and they take off into an intense prog/jazz sphere that includes elements of jazz fusion, space rock, Magma and Univers Zero. Contemporary space improvisors Escapade came to mind a lot during this track too. LOTS happening over nearly 17 minutes. And once again, despite some bumps in the road, much of this sounds composed rather than spontaneously combusted as it was. "Phunnig" is an ambient-jazz tune that bops along at an even pace, and establishes a nice groove, though it didn't really hold my attention coming on the heels of the much more exciting "Ululating". The closing track, and the longest at nearly 18 minutes, is "Return To The Planet Of Slack". This is the most freeform track on the album, with the musicians at many times occupying their own individual space within the whole. But it works very well, and even with multiple changes in direction everything stays together quite nicely and the musicians seem comfortable enough with each other to travel on their own while at all times aware of how it fits with the others. Some of the jazzier parts remind me of Soft Machine circa Third! An enjoyable but challenging voyage that requires multiple spins to catch everything that's happening. In summary, The Lords Of True Slack covered a lot of ground and will appeal to fans of ambient space, jazz, and avant-prog, who are also open to free improvisation. Make the effort and give this a dedicated headphones listen and you'll be delighted with what you hear. For more information you can visit the Eric Wallack web site at: http://www.angelfire.com/indie/ericwallack/Eric_s_Homepage_1.htm. Good Night Effendi is available for $6 from Eric Wallack; 445 North Main St; Bowling Green, OH 43402.